Looking for whimsical, creative or clever planters for some of your plants. Check out this list of some really cute ideas. When someone gives me a new plant, immediately I think of a way to showcase it. Recently, a friend gave me a piece of Swedish Ivy which is a descendant from the original plant in John F. Kennedy’s office in the White House. I looked around the house and where I keep all my pots, but nothing really stood out as a new home for this starter plant. I looked on Pinterest for an idea and got sidetracked with all the creative and clever planters out there and I just had to share a few of them. Most of my larger planters are outdoors and I have been wanting to make a chair planter for so long. I am still wanting to find an old washtub to put on the front porch. And who doesn’t love a vintage bike overflowing with flowers? I have so many African Violets on a shelf on my patio and recently someone gave me some cute teacups with holes already drilling in the bottom of them. 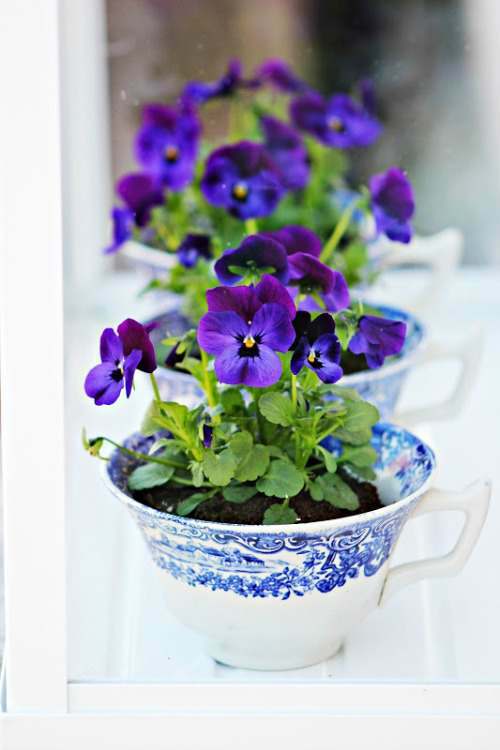 Perfect to showcase some of my violets and what a presentation for a gift. There are so many household items we use that would make great planters. Vintage cans, jars, and bottles can find in thrift stores or stop by your local Goodwill. 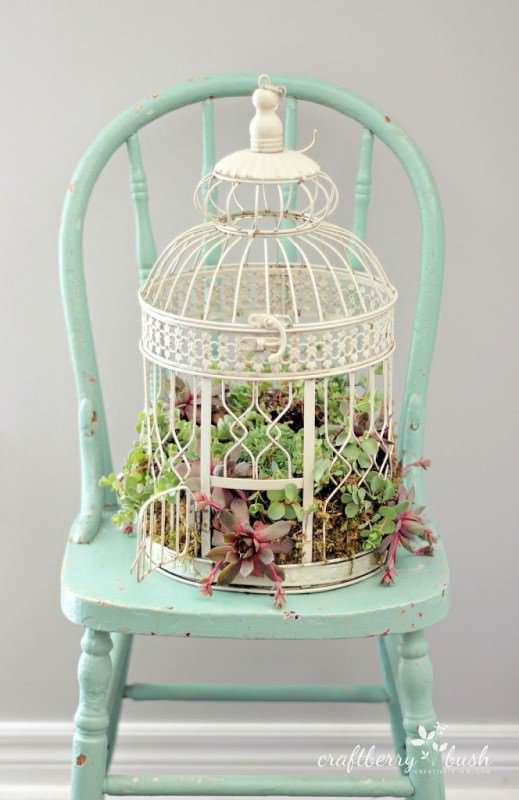 And for a whimsical planter how about an old birdcage, metal toy trucks, old baskets, and picture frames. I will be looking in our local antique and thrift stores for the perfect spot for my new special plant from the White House. I’m thinking maybe an old coffee can. 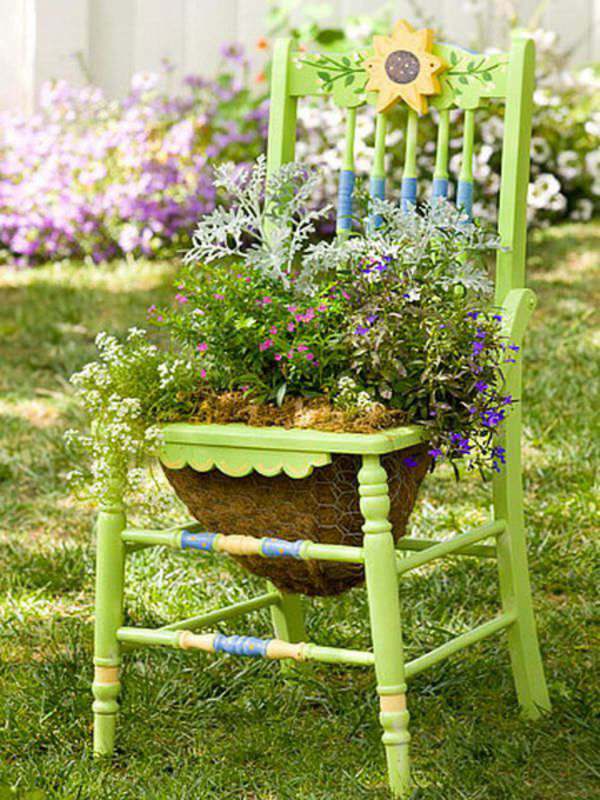 What would you use for a fun planter? I personally love seeing unique and unusual planters. It seems to add a bit of pop to the garden or home. The birdcage one is beautiful. 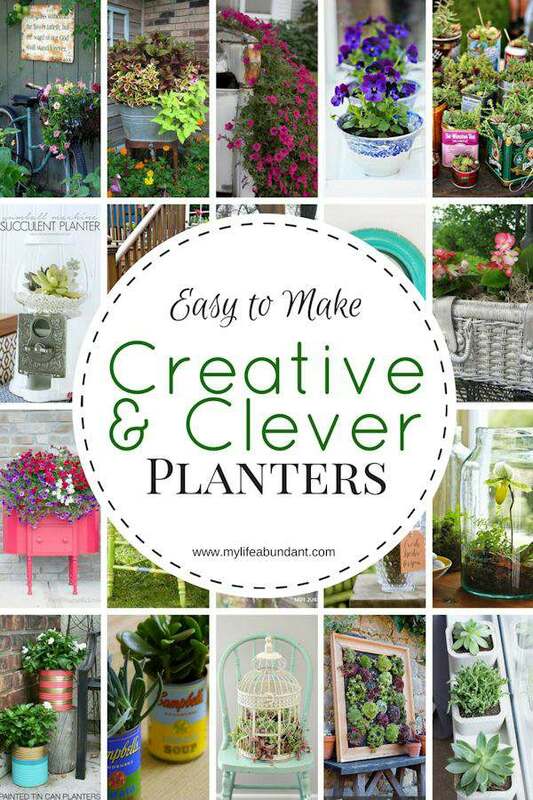 I love all these creative planter ideas! I like the idea of using old aluminum cans for small succulents. I absolutely adore ALL of those. So cute and they would go with just about any scheme too! Some of these ideas are so cute! I absolutely love neat planters! I made one out of two old tires! Awww these ideas are brilliant! I love the bird cage, so cute!! I definitely need to be more creative with my plants.